For further information, check here. Congratulations to Karen and Steve. If you want to use Turnitin as well, please check our Turnitin Feedback Studio page, or contact the instructional design team at Adams Center for help. The Adams Center would like to recognize faculty who have exhibited extraordinary teaching, scholarship and service. We want to congratulate faculty members for their hard work, achievements and advancements in their field. This month we are spotlighting Jonathan Camp, who was nominated for his research in introducing genomics to his CORE 210 class. In my CORE 210: Identity and Community class, my co-teacher Trevor Thompson and I invited a dozen students to participate with us in sending off a vial of DNA to be tested for ethnicity. We got the results a few weeks later, interviewed the students and discussed in class what we learned from this experience. This was a pilot study that we intend to continue with more students, especially as the technology improves. Contemporary genomics offers an unprecedented glimpse into our past. Sometimes, the story in the DNA doesn’t necessarily match the story that is handed down. How does learning about our deeper ancestry impact how we understand ourselves, and how we communicate who we are? More importantly, as a communication scholar, I’m interested in how the experience of DNA testing can help us question harmful categories of “race” and move toward a more constructive, bridge-building dialogue. Whether you believe we are descended from Adam and Eve or evolved biologically from stardust, genomics research shows that we are all deeply connected. Why do you think it is important to incorporate this practice into the classroom? One of our required texts was Deep Ancestry by anthropologist and geneticist Spencer Wells, who led The Genomic Project from 2005-2015. This book introduced students to the science of genomics and gave us a platform for informed conversations about the impact of DNA research for new understandings of our main subjects in the course–the nature of human identity and community. What better way to enliven this subject matter than to participate directly in it? Thus, this integration of content with research created a unique opportunity for engaged learning. Obviously, we who participated in the DNA project were impacted the most, since it was our individual DNA that we sent off for analysis to determine where in the world our ancestors came from. For instance, I learned that I am mostly Irish. I didn’t know that, nor did my parents, although a good friend quipped, “Well, that explains a lot!” A student-participant was astounded to find out how much Native American ancestry was reflected in his DNA, which prompted a desire to learn more about “that side of his family,” as well as the general history of native populations on this continent. Although these personal narratives are inherently interesting and shed an intimate light on course content, we hope the impact spreads beyond the personal, and helps us frame more constructive conversations about how we are connected on this planet. I’m wanting a greater depth of richness in the reporting of research. So, as we move forward with more rounds of study, I’d like to integrate student-produced digital story-telling projects, perhaps to be featured on a blog platform. The Adams Center would like to recognize faculty who have exhibited extraordinary teaching, scholarship and service. We want to congratulate faculty members for their hard work, achievements and advancements in their field. This month we are spotlighting Houston Heflin, who was nominated for his research on the impact of mobile technology on student learning. Over the past two years I have collaborated with the Adams Center and Cornerstone faculty to investigate the efficacy of HeadsUp as a technology tool in collaborative learning environments (small groups). HeadsUp was created at ACU to facilitate assigning students to small groups and then disseminating prompts as well as roles for students to fill as they engage in conversations created by an instructor. Beyond positive faculty reports of its effectiveness, we were interested in learning what influence HeadsUp has on student engagement and critical thinking. Our research involved 159 students participating in 39 different small groups that were constructed in one of three ways: “common practice,” “best practice,” and “HeadsUp.” The common practice groups were characterized by the instructor verbally stating the prompt and the students self-selecting the small groups. The best practice groups were distinguished by the instructor handing out a written prompt and the students being assigned to random groups. Finally, HeadsUp groups were also assigned random small groups and had the written prompt for the small group on their mobile device. Each group was required to answer the prompt with a written response at the end of their group time. Comparing the qualitative data from the written responses, the quantitative data from exit surveys of students, and most interestingly, the video footage of these students involved in their small groups, we are hoping to draw conclusions about the most effective ways for teachers to construct small groups and implement technology in classes. It is now commonly accepted that lecture cannot be the only teaching strategy used in college classrooms where faculty seek student engagement. Collaborative learning environments (or small groups) are one way to help students engage one another and the content of our courses. But what exactly is happening in these small groups? Many faculty have observed social loafing and passive group participants who use small group time as an opportunity to disengage. Is there any critical thinking happening in the best small groups? How might faculty construct small groups so that students are truly learning? And how can technology be employed in classes so that it facilitates rather than distracts from learning? These are questions we hope to answer. As we reach conclusions to these questions, we believe they have the potential to improve the quality of our teaching and the quality of our students’ learning. Why do you think it is important to incorporate this practices into the classroom? Some small groups demand more of students, requiring them to follow specific, layered instructions. Some small groups require students to take a position on an issue they might not agree with. Some small groups require students to fulfill a role for the group to function. And some small groups require written or verbal products at the end of the group time. Theses are just a handful of the many ways small groups are constructed differently, and they may all impact learning differently. We want to know what these differences mean for learners. The people most impacted by collaborative learning environments and technology are the faculty and students who use these tools in the classroom. 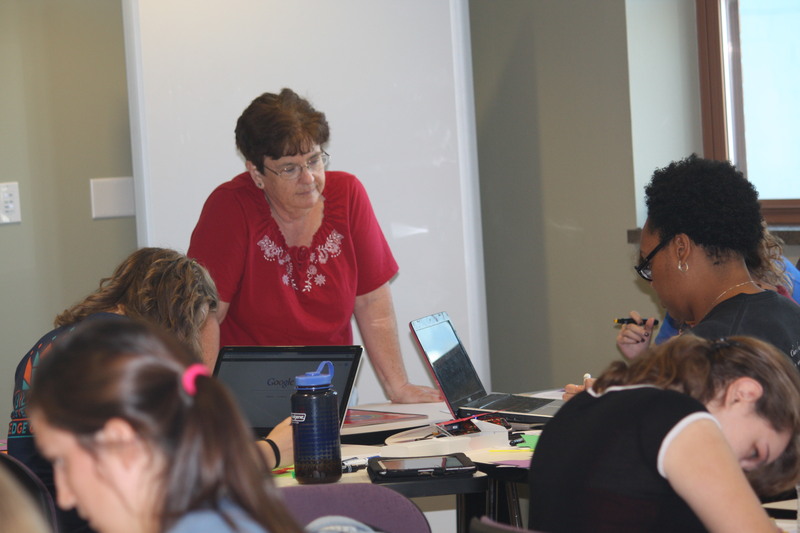 Faculty at ACU have access to many resources and technology tools, but it often takes work to learn the tools that are most effective for the courses we teach. In addition, we are not always sure about the positive impact it has on education — if the payoff is worth the effort to learn the tool. When our work is completed, we hope to be able to speak confidently about the ways faculty can construct small groups in order to promote learning. We also hope to describe ways technology can supplement our teaching and not distract students during small group discussions. Ultimately, I hope the faculty at ACU will continue innovating in the classroom, whether through the use of technology or other teaching strategies such as small groups, to promote more student engagement and, ultimately, student learning. For further information on Houston’s research, please see his Adams Center presentation, The Impact of Mobile Technology on Student Attitudes, Engagement, and Learning. The Adams Center would like to recognize faculty who have exhibited extraordinary teaching, scholarship and service. We want to congratulate faculty members for their hard work, achievements and advancements in their field. This month we are spotlighting Terry Baggs and Denise Barnett, who were nominated for their research on predicting success in graduate programs when looking at cognitive variables. 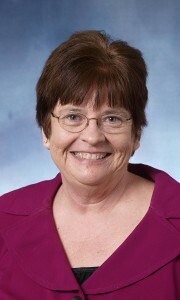 We partnered with Kim McCullough of Appalachian State University to embark on a multi-year and multi-university research project to assess the relationship between the cognitive variables commonly used in graduate admissions with a student’s success in graduate speech-language pathology. This project became the largest known project of its kind. For the independent variables, we considered overall GPA, GPA in the major, GRE scores, and science courses required by the American-Speech-Language-Hearing Association. (These courses include biological science, physical science, and speech-hearing science.) Because our secondary accreditation body gauges program success based on student’s credentialing examination, the Praxis, it was decided to utilize the Praxis score as the dependent variable. More than 200 graduate students at four universities in the mid-south and southwestern United States participated with a response rate of 97%. 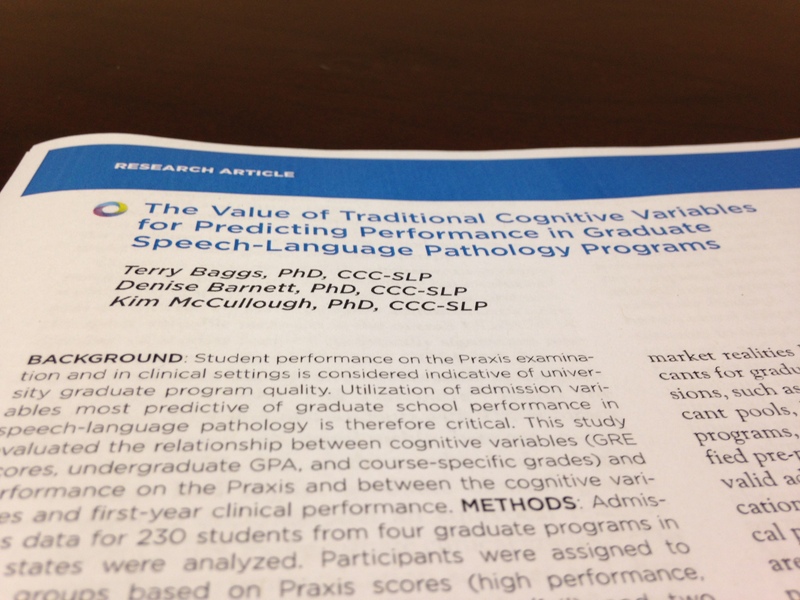 We found that course grades in physical science and speech-hearing science and scores on the GRE were able to predict success on the Praxis examination with a high degree of accuracy. Being part of a clinical rehabilitation profession, we were also interested in knowing if any of these independent variables were related to clinical success. We discovered a significant correlation between the quantitative score of the GRE and clinical performance. These findings were published recently in the Journal of Allied Health (JAH, 2015, 44, 10-16). All rehabilitation therapies (PT, OT, and Speech) are experiencing record demand for therapists and subsequent record numbers of applications for graduate school. Admission committees talk about numbers of applicants typically in the hundreds per program for only a few openings. (We have personally experienced this at ACU. This year, our program received 227 applications for 24 openings.) Can we improve the admission process by assessing typical variables? Is it possible to make the process more efficient by assessing the predictive value of these variables? Our findings have helped us solidify our admissions process here at ACU. University graduate admissions committees have an ethical responsibility to students, potential future patients, and other constituents to admit only qualified applicants for their graduate programs. It is important to accept students who can meet the demands of academic and clinical work and pass their credentialing examination without the need for remediation. We believe that graduate admissions should not be relegated to guesswork but be grounded in an evidence base. We believe this research assists graduate programs in finding the students who will succeed academically and become an exceptional therapist. This research impacts potential students, graduate programs, and future patients who will benefit from the services of our graduates. Our first research project was recently published in the Journal of Allied Health. We are hopeful that many university admissions committees will benefit from our findings and will be able to advocate for modifying the process. 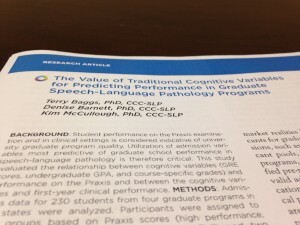 Because of the aforementioned findings, we are embarking on a new study to assess the relationship between the SAT/ACT scores and the GRE in speech-language pathology students. We believe that early identification may assist undergraduate programs in recognizing good students who need some assistance in developing skills that will lead to acceptance into a graduate program. The Adams Center would like to recognize faculty who have exhibited extraordinary teaching, scholarship and service. We want to congratulate faculty members for their hard work, achievements and advancements in their field. 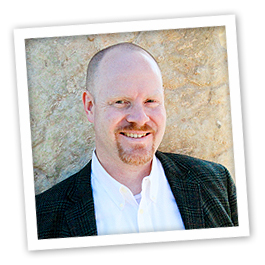 This month we are spotlighting Sam Stewart who was nominated by his department chair for his excellent example in project-based approaches, facilitating effective peer feedback, and mastery approaches to assessment. In order to assure student competence as a potential teacher educator, I am requiring mastery on all assignments in my classes. Simply stated, if a student fails to score at or above a 74% level on the assignment, the student must redo the assignment to a level that is at a minimum score of 74%. In addition, not turning in an assignment is not an option if the student wants to satisfactorily complete the course. My first reason for requiring mastery is that I want to model for my students, who are aspiring teachers, that good teaching is not about students obtaining good grades but is about what students learn. I make it a point to not assign what might be thought of as busy work and make sure that my students know why the assignment is of value. If the assignment is not important enough to be required to be done correctly, then it is not an assignment worth doing. My second reason for requiring mastery is that I teach in a professional licensure program. Just as I would not want a physician or attorney who are not competent treating or representing me, I do not want to license teachers who have not demonstrated competence in skills and knowledge necessary to be a successful teacher. For too long it has been possible for students to play the grade game and not learn the content and skills being taught. This has been true at the K-12 level and at the college level. For example, a high school student might go to class every day, be on time, do all the homework, and receive a good grade even though the student failed to master or even comprehend some of the concepts being taught. Another example is that a really good student with many good grades might just opt to not do an assignment because as they calculate their grade they find they can take a zero and still maintain a grade that is acceptable to them. Ironically, the students in my classes are being impacted most as their grades are improved by the fact they are held to a mastery standard. It is really difficult to fail a class where you have completed all work competently. It also removes a significant amount of stress from the classroom as the students and I are all focused on the learning and not on the grade. A second group that I hope are impacted greatly are the future students of my teacher education students. When my students become teachers, I am hopeful they will change the classroom culture to focus on learning and not on grades. This allows the classroom to be a place where everyone has hope; a place where teaching and learning are not punitive in nature. When my students become teachers I am hopeful they will change their classroom culture and hopefully that of the schools where they work to focus on learning and not on grades. This allows the classroom to be a place where everyone has hope and teaching and learning are not punitive in nature. It is time that K-12 education becomes a places where it is the student and the teacher against the material, and students are evaluated by demonstrating competence on standards. This article was originally published with Faculty Focus on June 8, 2015. Ideas of this article come mostly from my interaction with our faculty, as well as participation in the “Make it stick” reading group led by Dr. Bob McKelvain. We encourage you to participate in Adams Center events in which such ideas are discussed. Here are a few suggestions for providing students with the proper balance of challenge and support. Allow chaos. Students should learn to tolerate some uncertainty and vagueness in the learning process. “Figuring it out” is part of the learning. While you don’t want to be deliberately confusing, you also do not have to oversimplify some necessary complexity in order for students to learn. Some vagueness can encourage creativity. In our university, some of our professors, such as psychology professor Jennifer Shewmaker, have even started to experiment with what we call “free-range assignments.” With this approach, students are not prescribed a detailed set of assignments. Instead, they get to define what kind of assignments they will hand in, as long as the assignments illustrate their mastery of the learning outcomes. Embrace desirable difficulty. Desirable difficulty is something that cognitive scientists believe is helpful for learning (Brown et al., 2014). Do not step in too quickly to help the moment a student appears to stumble or starts to complain that something is too hard or they “don’t get it.” Reflect first whether the task is indeed prohibitively difficult, in which case you would need to add some prerequisite training. If the task is appropriately difficult, communicate that to students and expect them to persist in seeking answers. Increase accountability. There are things students have to learn to do. For instance, if technology is used heavily in class, students should learn to perform some tasks, such as clearing the cache of their browsers. If I argue that students should increase their digital literacy of the type of tools they will likely use in the workplace, most professors would agree. However, some professors may direct students to support professionals at the slightest suggestion of a problem. Eventually these students learn to go to others for answers rather than try to solve problems on their own. The bottom line is: help students, but don’t teach helplessness. Reduce redundancy. Students sometimes treat the course syllabus like those terms of service agreements that are so pervasive on websites and apps. They accept it without actually reading it. Admonitions that “It’s all in the syllabus” do not help. However, just because students choose not to read the class syllabus does not mean you have to repeat an instruction 20 times in a course. You can post certain instructions (how to participate in discussions, for instance) once, quiz them if needed, and be done with it. Do not repeat the instructions every time there is a class discussion. Remove crutches. Professors should help students learn the process of finishing a product without having to rely on constant feedback and guidance. One of our professors, Suanna Davis, recently shared with me a brilliant approach for gradually empowering students to do independent work. Davis has six major assignments in her class. Each assignment involves, say, four steps. For assignment one, she asks students to submit their work for each of the four steps so that she can provide detailed feedback to make sure they understand the process. For subsequent assignments, she gradually removes requirements for some of the steps. For the last assignment, she asks students to submit only the final paper, which she grades with a rubric. As she reduces and removes process-related requirements, the steps for the assignments are still included in the schedule until the final project, even though they are not required to turn anything in. By doing so, she teaches students the enabling tasks for completing their assignments, while empowering them to work increasingly independently. Mix pull and push. There is certain information you want to push to students, but it is also reasonable to expect them to pull other information. You do not have to send students the syllabus again and again when they request it, especially if it creates a distraction for students who have already obtained what you want them to have. Instead, include a syllabus or orientation module online and ask students to download or view such instructions themselves when they need it. I understand that educators walk a tightrope between supporting students and challenging them to be more self-directed learners. Yet it is not impossible to eventually find a good balance. Like building skyscrapers, you start by having scaffolds, but eventually, you want to remove the scaffolds and let students stand on their own. Brown, P. C., Roediger III, H. L., and McDaniel, M. A. (2014). Make It Stick: The Science of Successful Learning. Cambridge, Massachusetts: The Belknap Press. The Adams Center would like to recognize faculty who have exhibited extraordinary teaching, scholarship and service. We want to congratulate faculty members for their hard work, achievements and advancements in their field. This month we are spotlighting Jill Scott, who was nominated by her department chair for her work with Reagan Elementary to provide hands-on training for teacher candidates and academic support for Reagan’s teachers and students. I have created a unique learning experience for ACU teacher candidates called Reading Rangers, an after-school tutoring program at Reagan Elementary. I started this program as part of the course READ 480 Problems in Reading. This senior level field-based course serves as the culminating literacy course for elementary teacher candidates. Developed in the style of project-based learning, students in this course are challenged to combine theory, best practices, knowledge of assessment and interpersonal skills to create a learning environment and instructional sessions for a first or second grade struggling reader. After several weeks of front loading information, the teacher candidates work in groups to take an empty room at Reagan Elementary and create their own model classroom. Simulating their first year of teaching, candidates use the furniture and materials on hand to create the learning environments. They design the floor plan, create literacy stations and develop materials. Each teacher candidate is then assigned a struggling reader. The teacher candidate will assess the student, develop an instructional plan and deliver at least 12 lessons, while continually monitoring student progress. Interaction with parents and other school personnel is a unique feature of this program. Parents are invited to an open house before tutoring starts and a Readers’ Theater presentation is at the end. At the end of each session, the teacher candidates have an additional opportunity to interact with the students’ families. They hold a conference with their student’s teacher to share their student’s work and make suggestions for further learning. Often times, in this authentic setting, the teacher candidates have additional opportunities to work with principals, nurses and custodians to resolve problems or create learning opportunities. These types of opportunities are unique to the setting. New teachers have many challenges their first few years of teaching. I feel strongly that it is my responsibility to prepare our teacher candidates to meet these challenges. The best way I have found to do that is to provide real life situations where I am in the situation with them, providing modeling and support but not all the answers. I tell my students that they will not like me very much at the beginning of this project, because I will not give them the answers. In a very Socratic teaching manner, I ask more questions than I give answers. When they ask me how they should set up the classroom, or where they can get materials, or what they need to do next, I respond with “What do you think?” Allowing them to synthesize all their knowledge and tools to create their own answers not only forces them to work at a higher level, it creates confidence and experiences for them to fall back on. I do promise them that I will not let them fail. My work at Reagan Elementary began as a response to a request from the Abilene Independent School District’s administration. This was a great opportunity to develop a professional partnership that extended beyond Reading Rangers. Reagan Elementary has a high at-risk population, much like the schools where I spent my 36 years of teaching. 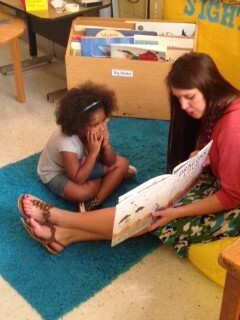 Providing extra support for the students and teachers through the tutoring sessions is one way to help. Over the four years that I have been working with Reagan, their students’ achievement have risen in all academic areas. In addition to Reading Rangers, I mentor teachers and administrators, volunteer in classrooms and provide in-service training. I serve on several of their campus committees. Other courses and professors have worked at Reagan providing similar activities. Many of their teachers serve as cooperating teachers for our teacher candidates. This partnership continues to grow with their involvement with our Master’s in Teaching and Learning. Giving the students opportunities to use their knowledge and skills in real life settings is what learning to be a teacher is all about. I can talk about the importance of classroom environment and explain theory, but when a teacher candidate finds herself facing a blackboard with the students behind her and not knowing what is going on, it becomes a reality. When a teacher candidate asks her student why he is taking home canned food in a backpack and learns that the child is homeless and the school is helping to feed the family, the reality of teaching is evident. Modeling respectful interactions with parents cannot be done in the typical university classroom. Teaching problem solving and on the spot decision making cannot be replicated in a traditional classroom. This lab setting provides those types of opportunities. ACU graduates return after their first year or two of teaching and point to specific situations that occurred in Reading Rangers that helped them deal with situations in their teaching. Although all stakeholders (me, ACU students, AISD teachers, AISD students) are being impacted, I believe it is the ACU teacher candidates that are most impacted. These new teachers then go forward and impact their students. One of my former students shared with another professor that every time she faces a difficult parent “she sees and hears Dr. Scott and the way she treated parents.” I cannot create these experiences; they just happen during Reading Rangers. Our graduates are becoming the teacher leaders on their campuses because in part from some of the experiences they have in Reading Rangers. As AISD has moved to using the Fountas and Pinnell Benchmark testing which we teach in READ 480, our students have become the experts even as student teachers. I hope to continue working in situations that provide real life opportunities for teacher candidates to work with students where more knowledgeable others, including myself, can serve as models. I would love to work more in partner schools or develop a lab school where all our teaching is done in a cooperative manner. Following Vygotsky’s apprenticeship model in a lab school will always be my dream. Lynette Austin designs Language Assessment Tool with Pearson Education, Inc. I am working with Pearson Education, Inc. to design a special language assessment tool to be utilized with children who are English language learners (ELLS) and who are suspected of having a language/learning disability. The type of assessment is called a “dynamic assessment”; it is intended to measure a child’s capacity to learn a new language-based skill during a brief, interactive (dynamic) teaching session. Whereas a traditional language test checks what a child knows and does not know in different language areas, and then computes a score, this type of assessment tool will look at a quality called “modifiability,” (how easily can the child change and learn). It will also measure the amount of effort and time it takes to teach the skill to a particular child. Once completed, the measure should be able to compare the data collected on a specific client to a database of results from children who are typical English language learners. Current literature indicates that this type of measure can help identify those who are struggling with learning the new language due to a disability rather than a language difference stemming from having a diverse language background. My graduate student researchers and I have developed two of the three projected tasks for the assessment, and designed an assessment protocol and procedural guide. We also have created a “mock-up” of the interactive teaching activities to be used (all the materials will eventually be available on a digital platform; likely a web-based application). We have collected research data on whether or not the dynamic assessment tool is effective at facilitating and measuring change in some English skills for these children–and the data so far indicates that it is! The tasks are now being sent out to speech-language pathologists in the field for their feedback. One of my primary teaching and research interests, and an area in which I continue to practice as a speech-language pathology consultant, is in the area of service delivery to individuals who have diverse cultural and language backgrounds (CLD). We have a history in Texas and in the US of over-identifying language disabilities in the CLD population, and that is a discriminatory practice (although accidental!). It is very difficult for speech and language pathologists to test children in this country who are learning to speak English, and do so in a way that is language–and culture–fair. Obviously, English language learners do not yet speak English fluently, so our typical speech and language tests don’t work for them. Furthermore, it is often impossible to find assessment tool in these children’s home languages (L1). For this reason, we need reasonable ways to look at what they are able to do with the English they have learned, and decide if they are showing adequate language-learing skills. English language learners are often referred by physicians, teachers and others for speech and language assessment; we must have assessment strategies that are supported by research to effectively assess speakers with limited English skills. I’m excited about developing an assessment tool that can hopefully be used with speakers from a variety of language backgrounds to provide more accurate speech and language diagnoses for them! Why do you think its important to incorporate this practice into the classroom? Undergraduate and graduate students who are studying speech and language pathology need to understand the scope of this problem–that of over-identifying English language learners as having language disabilities when actually they don’t. Our population in Texas and in the US is growing ever more diverse, and all speech-language pathologists in the future will need to know how to appropriately work with these populations. 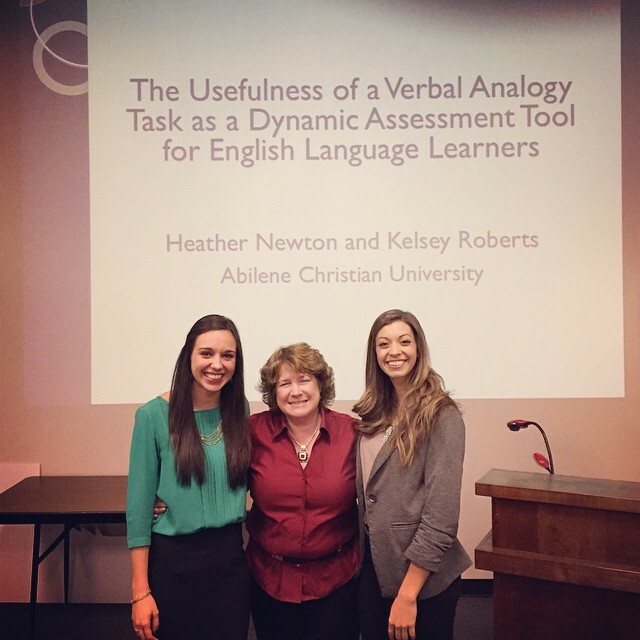 I think that participating in this research has helped my graduate students be much more thoughtful in how they approach language assessment–I know that those on my team are very well equipped to assess ELLS! In the undergraduate classroom, I introduce students to the topic of dynamic assessment for ELLS as an example of an appropriate alternative assessment strategy, so that as they move through the rest of their professional preparation they are alerted to and aware of the idea of culture-fair assessment (which is an area that is not away thoroughly addressed in graduate speech pathology programs). Right now I believe that graduate students in our program are those who are most impacted, as they learn how to design and conduct alternative assessments for ELLS. However, I think ultimately the children for whom this measure is designed will be the most impacted, as this should increase diagnosis accuracy for young ELLS begin tested for language disabilities. Our hope is that this assessment tool will be made available to SLPS throughout the country as a web-based application. The current project addresses ELLS who are between 6-8 years of age; we are in the process of considering dynamic assessment tasks for older children as well. I was invited to participate in a sculpture show titled US-Japan Art Exhibition at the Tokyo Museum of Art in Tokyo, Japan. The dates for the exhibition are March 20-28 of 2015. 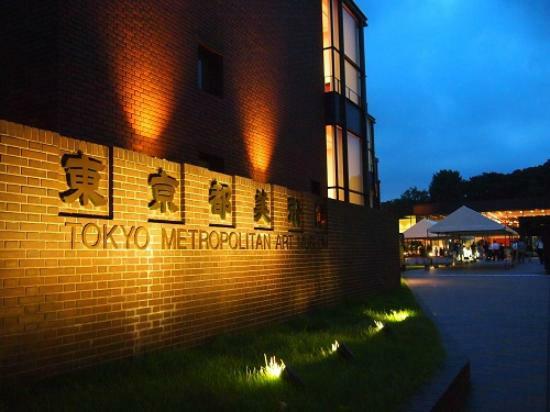 It is my understanding that there was an intention to invite 15 American artists and a similar number of Japanese artists to participate with their work. There will be events such as gallery talks by artists, receptions, and tours for those not familiar with the area. Each artist will submit one sculpture to the show and are expected to remain in Japan for the duration. 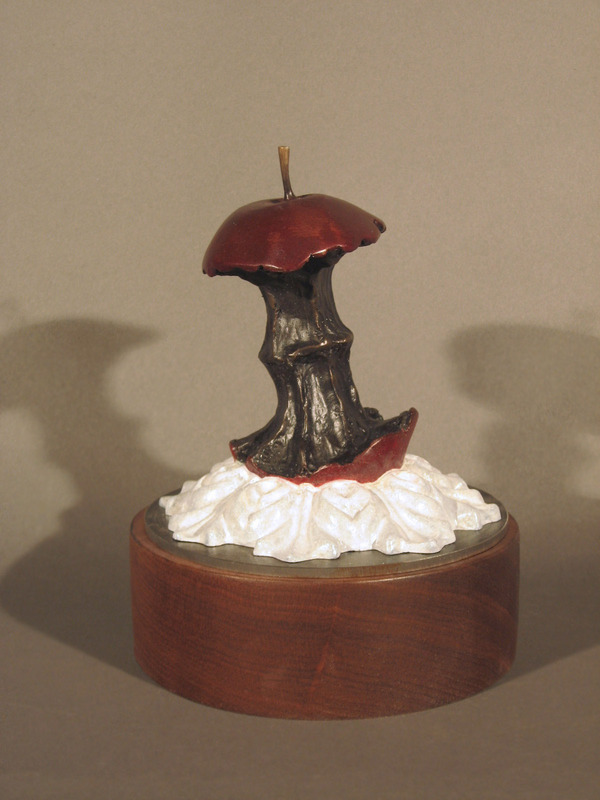 I believe that this idea came about because of relationships formed at The Texas Sculpture Symposium at Midwestern State University in November of 2013. I am a member along with several other cast iron artists of a group called the Texas Atomic Iron Commission. We put on a casting demonstration and sculpture exhibition at the symposium and there was also a visiting artist from Japan named Hironari Kubota exhibiting as well. The sculpture professor at Midwestern State is Suguru Hiraide, also from Japan. Relationships were formed at this successful event that led to later discussions between Suguru and Hironari about co-curating a sculpture exhibition in a high profile venue in Tokyo. 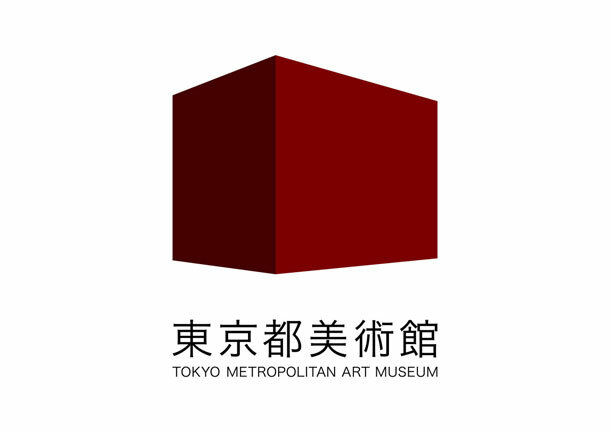 They submitted a proposal for a show that would combine Japanese and American artists to the Tokyo Museum of Art and it was accepted. It was after this that the American artists were given invitations to participate. I strongly believe that the relationships formed at the symposium between certain artists with Hironari and his impression of the sculpture being shown led him to the idea of reciprocating with an even higher profile venue overseas. I do not know all of the artists participating from the United States but several were from the show at the symposium. All of us I am sure will be anxious to form new relationships and experience another culture in a context that highlights our talents as well. Why do you think it is important to incorporate this practice into the classroom? Who is being impacted the most? There are always implications of enrichment in teaching with new experiences. There are the international students who have differing cultural backgrounds that can be related to through common experiences and the discussions of universal or specific symbolic objects used in art pieces that have cultural context. What hopes do you have for the future through your work? As a member of the Texas Atomic Iron Commission I am required to stay up to date with casting technology and be willing to carry a share of the responsibilities relating to demonstrations that we offer. I built a portable iron melting cupolette for travel that resides in the sculpture area of ACU Art and Design. This equipment has led to some important relationship building at national events, other universities, as well as the Narrowgate Foundation in Tennessee that is a highly spiritual venue for which I was recognized last year with the Faith and Teaching award. I never underestimate the power of relationships that develop and where that can lead. I have former students that reside in Japan and have come back to visit bearing gifts and news of their achievements in life. Our university has had many connections overseas having to do with various disciplines and now Art and Design is making its mark. The members of the Texas Atomic Iron Commission have been putting on demonstrations and exhibitions since 2005 knowing that each event would enlarge our sphere of influence and build new relationships that continue to lead to more opportunities. This will be one of those opportunities.